Not all electronic devices in your RV can run on 12 volt DC power. Sometimes you need 120 volt AC power. Whether it is your laptop, television or gaming console, you will most likely need 120 volt AC power in your RV. It is always best to be prepared for these situations and that is where an AC power inverter from Dyersonline.com comes in. Dyers online offers a wide variety of power inverters to fit your application, budget and power needs. We offer models from Go Power and Xantrex. All of our power inverters feature mounting brackets to ensure safe mounting within your RV. We have models ranging from 175 watts for basic needs all the way up to 5000 watts, to power an entire household of electronics. Power inverters are an essential component of your RV and proper installation as well as management of your power inverter is incredibly important. Most power inverters do not come with the required equipment for complete installation in your RV. The two main components you will need for proper installation are large gauge cabling and a fuse block. Due to the high amperage of DC voltage being transferred to your power inverter, not just any cable will suffice. Only heavy gauge cables will be able to safely handle the amperage. For example, 3000 watt installations will require massive 4/0 gauge wire whereas 1500 watt installation will need the much smaller #2 gauge wire. Using the proper gauge wire is essential to your safety. If wire that is too small is used it can result in the cable overheating and causing a fire. 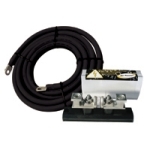 The second part of the installation kit is the fuse block which is included in all of our installation kits. The appropriate amperage fuse is supplied with all of our installation kits. You can also purchase the fuse block separately from the installation kit if you do not require the entire installation kit. Some sensitive electronics such as televisions and computers require a very clean sine wave signal coming from the AC outlet. We offer a variety of power inverter models that provide a pure sine wave output to insure reliability of your electronic devices. These pure sine wave power inverters offer the peace of mind required when using expensive and sensitive electronics. The ProWatt line from Xantrex is one such model that provides a true sine wave AC signal. The ProWatt SW 2000 provides 2000 watts of continuous power and can provide surge power up to 3000 watts for devices that may temporarily need more than 2000 watts. The ProWatt SW 2000 also provides a digital display to show you the input DC voltage, as well as the AC output voltage. In addition to these features it also has alarms and auto-shutdown protocols from low and high input voltage conditions. We also offer the Go Power Pure Sine Wave line of power inverters. They range from 1000 watts all the way up to 3000 watts with an incredible peak efficiency of 92% to ensure the inverter stays cool and your RV battery lasts as long as possible. Greater efficiency means lower long term costs to you. In most power inverter applications you will have the inverter hidden away where it is not easy to access the power switch. That is why Dyersonline.com offers a variety of remote power switch panels for use with Go Power and Xantrex power inverters. 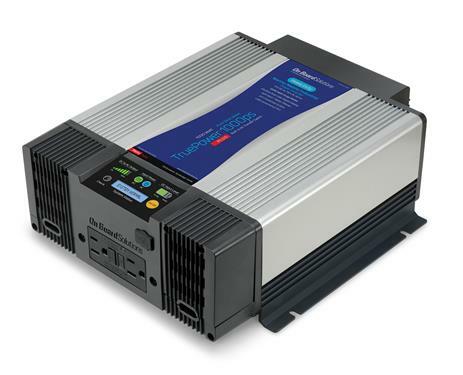 We offer basic models that simply turn the power inverter on and off as well as more advanced models that show battery level, power output as well as LED’s for any power anomalies. Our final power inverter accessory category is Xantrex’s line of dedicated power monitoring devices. The Xantrex LinkLite Monitor and LinkPro Monitor both have similar monitoring capabilities with the Lite version being able to monitor up to 1000 amps of DC current whereas the Pro variant is able to monitor up to 10,000 amps of DC current.